With Bacon Week in full swing, we knew we couldn’t let a Taco Tuesday pass without throwing some bacon into it. You might think this would be an easy task, but nope! Sure there are a ton of tacos that you could easily throw bacon into, but we really wanted to play up the bacon. That’s when it came to us! We’d do some version of the BLT in taco form! Thus our Salmon BLT Tacos were born! We went through a few iterations of the recipe trying different lettuces, bacon quantities, etc. It was difficult because we needed a component that would help make it feel less like a sandwich in a tortilla. That’s where the salmon came in. The richness of the salmon played perfectly with the saltiness of the bacon. Add a bit of arugula for a little bite and tomato for acidity and the perfect taco emerged! 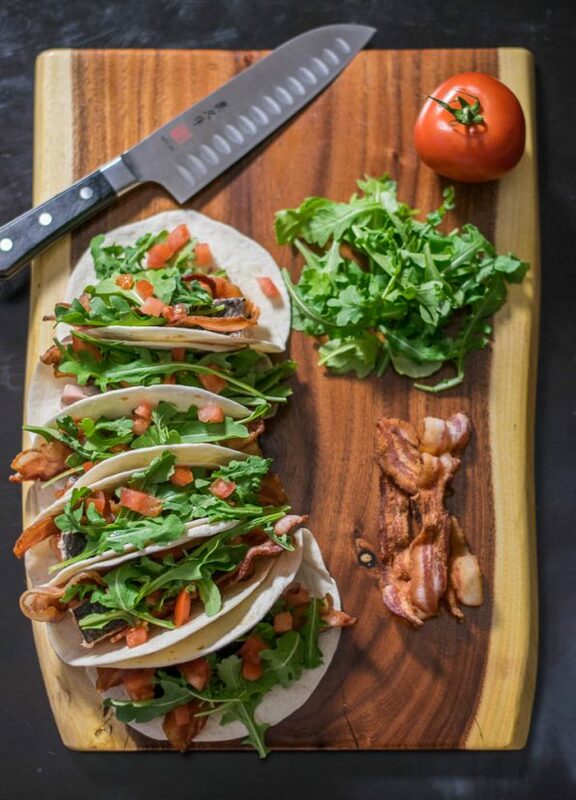 The great thing about our Salmon BLT Tacos are their versatility. Don’t feel like arugula? Add frisee. Want to church it up? Add a little hot sauce. You could even make it a lettuce wrap taco if you want something a bit lighter. There is a world of possibility! How do you like to add bacon to your tacos? We’d love to hear! Don’t forget the hash tag for Bacon Week is #GWEBacon! Salmon BLT Tacos are the perfect way to combine salmon and the quintessential diner sandwich into one delicious Taco Tuesday meal! Grill salmon to medium-medium rare. Cut salmon into strips or flake and place on tortilla. Add two strips of bacon. Top with arugula and tomatoes. *The Geeks were given product samples by Whole Foods Market to facilitate the creation of this recipe; However, opinions are wholly our own. View our Disclosure Policy for more info. ← Previous Previous post: With A Little Help From Whole Foods The Geeks Are Bringing Home the Bacon! Sounds fabulous! The boys will love those! This looks so yummy! I have to try it… Thanks for sharing.